This year’s ‘The State of Innovation’ report by Clarivate Analytics ranks Dundee as the most influential scientific research institution in pharmaceuticals for the period 2006-16. The University of Edinburgh is the only other UK representative in the top 10, which features prestigious institutions such as Switzerland’s Ecole Polytechnique Federale de Lausanne, the Technical University of Denmark and the Howard Hughes Medical Institute (US). Research at Dundee’s School of Life Sciences and School of Medicine is having a significant impact on research into therapeutic areas including cancer, arthritis, diabetes, lupus, hypertension and Parkinson’s disease. The University’s Drug Discovery Unit collaborates with partners to translate world-class biology research into novel drug targets and candidate drugs across multiple disease areas. Data for The State of Innovation was compiled by indexing more than 18,000 journals, as well as proceedings papers, book chapters and other materials, plus information on over 71 million patents. “This report demonstrates that research at the University of Dundee has had a transformational impact around the world over the past decade,” said Professor Sir Pete Downes, Principal and Vice-Chancellor of the University. 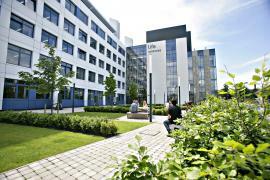 Dundee is the top ranked university in the UK for biological sciences, according to the 2014 Research Excellence Framework and is the central hub for a multi-million pound biotechnology sector. The University’s research was also recently ranked the best in the UK at influencing innovation in the Nature Index 2017 Innovation supplement, while separately Dundee was named as being among Europe’s most innovative universities by Reuters. The State of Innovation showcases some of the latest inventions from around the world and focuses on trends in the top 12 industries. Those industries reviewed for the report reveal interesting new areas of innovation and an increasing trend towards blurring boundaries across sectors. Jay Nadler, Chief Executive Officer of Clarivate Analytics, said, “Our State of Innovation report inspires me. It not only showcases the latest inventions from around the world, we’ve also used our powerful products to uncover some intriguing analytics and insights about global innovation trends.